A NEW project for unemployed young people was officially wheeled out in Sheerwater on Thursday. Aimed at giving 18 to 24-year-olds not in education, employment or training (NEET) a useful life skill and confidence boost, Woking Bike Repair is a two-day-a-week course in cycle maintenance. 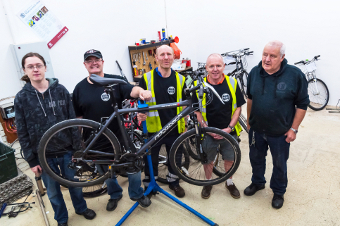 After six weeks, on completion, not only do they receive a Comprehensive Certificate in Cycle Repair and Maintenance, they also bag a free bike. The idea was instigated in Woking by the town’s Neighbourhood Advice Centre Grant Officer, Nadia Shabir. She contacted John Thurlow, who ran a successful two-year bike project in Guildford as part of the Surrey Life Long Learning Partnership, and he was only to happy to get involved and help transfer the expertise and skills team to Maybury and Sheerwater. After Trustee and Advice Centre Chairman, Mohammad Ali, approved the scheme, Nadia managed to secure a bid for funding from Travel Smart, who promote the reduction of carbon footprints through projects such as walking, cycling or car sharing. While repair work goes on at the back of the premises, front of shop Woking residents will be able to buy reasonably priced, fully refurbished donated bikes or have their existing bikes professionally serviced at low cost. Open to all who walk in off the street, the shop is run by volunteers to encourage more cycling in the community. They offer free information on cycling, maintenance and can advise what sort or bike best suits a person’s needs. Drop in to the Woking Bike Project shop at 35 Dartmouth Avenue, Sheerwater. Open on Mondays and Thursdays, 10am until 4pm. Donated bikes and volunteers are welcome. For more details, contact John Thurlow at jthurlow@surreyllp.org.uk or the Neighbourhood Advice Centre at wokingnac@gmail.com or on 07583 771607.